I have shared the following dream with only my family. I now understand its relevance and have decided to share it here on my blog. I am not prone to having prophetic dreams. I have only had two dreams that have ever stood out in my mind -- each unforgettable and a sense of having witnessed something that was not a product of an overactive imagination or too much pizza before going to sleep. That night, when I went to sleep I had a dream. Since I am not sure when the dream occurred during the night, it may have happened in the early hours of April 19. I had a dream in which I was in the White House. No one could see me. I could see Hillary Clinton, and she was looking through a narrow gap in a doorway, as though she had opened the door slightly to a room and was peering in. She was extremely angry. There was a bed in the room and it was made up, as though no one had slept in there, but I sensed it was not her bedroom. Draped neatly on the bed was a green dress. She saw the dress and this was what made her furious. Then the scene switched and I was in a different room in the White House, and I thought perhaps the Oval Office. It was very dark in the room, and I could see over a balcony onto a lawn. I heard hundreds of loud voices coming towards the White House and as I watched, a great many people were coming onto the lawn. They were dressed in clothes according to their profession. I could see farmers, doctors, lawyers, teachers, miners, and many, many others. There were too many people to even guess the number of them. They were carrying pitchforks and signs. I couldn't make out the words on the signs, but they were shouting and very angry. I thought I had been alone in the dark room, and then I sensed that someone else, a man, was watching the growing crowd. He looked upon them coolly, watching them in the dark. I could sense he was indifferent to their plight but quietly seething anger at their presence. I didn't see him do this, but I sensed he had been smoking a cigarette, taking long draws, inhaling deeply, and exhaling very little smoke. It was extremely dark behind the people, and it was not a natural darkness. I sensed a great spiritual darkness had come over the country, so dark that I know now what the darkness must have been like that fell upon the Egyptians during their time of judgment of the 10 plagues. The man did nothing but watch. Then I woke up. That morning, after taking my kids to school as they were still in public school at that time, I came home to pray. I knelt down to pray about my family and about the dream when a great intensity gripped my very soul and I began to pray deeply in the spirit. I knew then that this intercession was beyond my initial desire to pray about my family. Then, an explosion shook the house! It was so startling that I stopped praying. At that time, I lived 7 miles from the Murrah Building here in OKC. It had been blown up. The rest of the day was spent watching local TV and their wall-to-wall coverage of that event. I say all of that about the dream to say this: at first, I never fully understood what it meant. When the Monica Lewinsky scandal broke, I understood the dress part. Even though Lewinsky's dress was blue, the green in my dream was clearly envy on the part of Hillary. The neatly made bed, yet still a bedroom, indicated the sexual act that occurred between then President Bill Clinton and Lewinsky was not the actual bed kind, but it still occurred. I thought Hillary was furious because Bill nearly wrecked his career, but after this last election, I realize now his scandal impacted her own presidential ambitions. The part about the man in my dream, I wasn't sure about this until a very dear friend died in July. On the way home from the funeral (we had 18 hours in the car), my husband and I were talking about the dream when the understanding hit me! The tea party that is scheduled to take place in D.C. the weekend of 9-12, must be the event that I dreamed 14 years ago. There have been protests and marches in Washington before, but none like this. This one is directed at the president and his fiscal and health care policies. This president claims to be all about the people but his administraton is completely insulting to what the people truly want as far as his spending policies and health care reform are concerned. Does this president really want to look out of some window on the White House and see all those people protesting this administration and this Congress? People from all careers, occupations, and walks of life will be there, carrying signs and protesting. It is quite dark spiritually in this country. Our watchmen (David Wilkerson, Nathan Leal, Michael Boldea, Pastor Vincent Xavier and Daniel Eggers) are all crying out that America has fallen in the depths of apostasy and have become morally repugnant to God and that judgment is advancing swiftly towards us. This president has fallen victim to the same mad delusion that struck several of his predecessors: winning the golden prize of bringing peace to the Mid-East. William Koenig has laid out so well in his book Eye to Eye: the Consequences of Dividing Israel that whenever a president has reached out to touch the apple of God's eye, his hand is slapped hard! We have prophetic words from the past (A. A. Allen, Dimitru Duduman) that beg us to turn to God or else fall hard as previous defiant and rebellious civilizations have and be shattered like Obama's teleprompter. The part about Hillary in the dream was a marker -- a sign that she would once again reappear before this event. And she has. Not only did she run for the presidency, she is currently Secretary of State. God has timing for everything. This dream could have been given to me any night, so why this dream on the night of the worst terrorist attack on U.S. soil up until that time? Before 9/11, Tim McVeigh and the Murrah building bombing were THE standard. After 9/11, the man and the event became a footnote everywhere except in Oklahoma. The dream of April 18, 1995, came hours before a major terrorist attack. And though I did not dream of a terrorist attack, I dreamed of a president who would one day face an angry American public. If it is true, that the event that I dreamed is the 9-12 tea party in D.C., will it be followed by a terrorist attack? Is the tea party in D.C. a marker? that when we see this event we will see a terrorist attack? I truly solemnly pray to God that the dream I had years ago does not mean this, and that the dream has a different meaning. 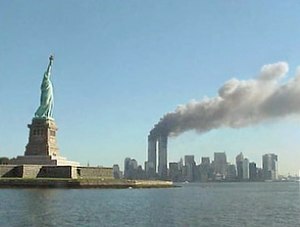 As many gather there this weekend beginning Friday, 9/11, keep eyes watchful toward that place. I received 20-FOLD in June 2009. Until that time, I had never received a prophetic word like it. The Lord showed me two great desolations are coming to the United States: an absolute collapse of our banking system and a great earthquake in the New Madrid seismic zone. The second desolation will be a great earthquake in the New Madrid seismic zone. When will this earthquake come to pass? I am not certain, but I do believe something will happen in New York City first. I don't know what it is, but I have felt watchful toward that place. The trees that fell in the huge wind storm August 18, were a warning of destruction coming. God always warns an area before judgment falls. I do believe that this massive earthquake will take place DURING THIS ADMINISTRATION. I believe it is strongly connected to the dividing of Israel, and more specifically, of coming up against Jerusalem to divide it (Zec. 12: 9). In my blog, I wrote about David Wilkerson of Times Square Church in Manhattan who wrote in his book The Vision about a massive earthquake that could possibly be the New Madrid. ". . .The research shows that seismic hazards haven't been limited to the New Madrid zone. Instead, they "migrate" within the larger Mississippi Embayment, a former inland sea filled with sediment deposited by the river. The embayment was formed when the continent nearly broke apart eons ago, creating a trough that was flooded by the Gulf of Mexico. August 5, 2009 - Daniel Boehler posted the following dream from John Kilpatrick. Kilpatrick is the former pastor of the Brownsville Church in Pensacola, Florida, and he received a dream May 20, 2008. Here is the dream. I awoke trembling and shaking at 5:00 in the morning after having a startling dream. This was one of the three most profound dreams that I have ever had during the ministry the LORD has called me to. I feel that this dream is an addendum to the vision I had on April 27, 2008. In this dream I saw the words wind and water. I only saw the words but did not actually see any wind or water damage. I then found myself overlooking a river which instantly became so wide that I could no longer see either of its banks. The dream then shifted, and I was with one of my parishioners running through what appeared to be an old abandoned school house. This empty building began to shake. The shaking was so violent and severe that it was like the bucking of a wild horse tossing us around. My teeth were clapping so hard from the impact that I tried to clinch them to prevent this from happening. In this dream I knew I was experiencing a massive earthquake. The sounds were so catastrophic that the thought crossed my mind that the devastation could likely exceed Hurricane Katrina of 2005. I did not see the devastation behind me; I only heard it. In all of my life I have never heard such catastrophic sounds. These were the scariest sounds I have ever heard. The dream then shifted once more and concluded with two names on what appeared to be an old Spanish map. One name read Indianola and the other Europa. When I awoke, I was shaking as if I had chills and fever. I could not stop trembling. All through the day I felt as if I had just had the dream 10 minutes ago. This dream so shook me that my wife and I immediately went to the internet to do some research. I also contacted some close friends in the ministry and reliable intercessors concerning this dream. What we found was startling. There are towns called Indianola, IL, Europa, MO, and Indianola, MS. These towns run in a line from North to South with Europa, MO being near the middle of them. The Mississippi River runs between them with Europa, MO being by the epicenter of the New Madrid fault. After seeing this, I believe the dream could be concerning a devastating earthquake on the New Madrid fault. Many reputable friends in ministry have felt that this dream was not to be interpreted as a spiritual dream because they felt that it has literal implications. Even now, two days later the intensity of this dream is the same. I do not want to come across as an alarmist concerning what I saw. I also don’t want to put fear in the public or the Body of Christ. However, I cannot help but feel that God gave me this as warning to prepare us for the days ahead and to pray concerning this matter. Please know that I did not see any time frame as to when this may happen. Please pray with me concerning this vision and dream. The first desolation will be the utter collapse of the banking system. ". . . The August Hat Trick Letter reports have identified five major factors pointing to a severely stressful period of time at the end of August and into September. The FDIC is scheduled to release its Second Quarter Report that could reveal up to 1000 banks expected to croak, surely enough to exhaust their rescue fund by between 20-fold and 100-fold. Tin cups are heading to the USCongress committees. The USGovt federal limit must be extended again, and Treasury Secy Geithner has requested a $12.1 trillion limit. That limit must be extended sometime again soon, like before next spring 2010. . . "